Equality for Flatbush (E4F) is a people of color-led, multi-national grassroots organization that does anti-police repression, affordable housing and anti-gentrification organizing in the Flatbush, East Flatbush and Brooklyn-wide. Founded in June of 2013, Equality for Flatbush was created as a direct response to the increase in tenant and police harassment due to gentrification. We have only 2 goals: to end NYPD murders and to stop the displacement of low to middle income people from our community. We organize our communities for social change and justice through street outreach, social media campaigns, political advocacy and direct action. Fighting Oppression // Building Power! Click each item below to read more about our accomplishments. We were active in supporting the families of Dwayne Jeune, Davonte Pressley, Kimani Gray, Kyam Livingston, Shantel Davis, Akai Gurley, and Delrawn Small. We specifically raised bail money and secured a new attorney for Davonte Pressley who survived being shot over 3 times by the NYPD on October 23rd, 2016. We also received a community service award from the family of Shantel Davis. In partnership, with the Street Vendor Project of the Urban Justice Center, we launched a campaign that successfully decreased the racially profiling and the economic harassment of street vendors In Flatbush, Brooklyn. The public campaign included an online and paper petition as well as a Spanish language film. We initiated the Rapid Response Legal Fund to support bail for survivors of police violence and prevent them from going to Riker’s Island post-assault. We participated in #SwipeItForward actions in Brooklyn to stop the arrests and targeting of poor and working class people of color who did not have the $2.75 fare to ride the MTA. We continued collecting data for our NYPD checkpoint survey to offer a Brooklyn-wide data collection tool including all police-related traffic stops. We maintained 3 phone/email hotlines in English, Spanish and Haitian Kreyol receiving between 2-4 calls per day from residents in need or crisis. We strengthened our relationships with Brooklyn Legal Services, Community Development Project, Brooklyn Legal Services Corp A and several private attorneys to work with rent-stabilized and low-income tenants. We have updated and maintained an extensive NYC, national, and the global list of grassroots organizations involved in fighting gentrification, promoting tenant organizing, resisting police brutality, organizing migrant communities, and demanding an end to LGBTQ violence. Through The Brooklyn Anti-gentrification Network, E4F was part of the leadership of the 1st ever Brooklyn-wide March against Gentrification, Racism, & Police Violence on September 9th that over 100 small businesses, community organizations, houses of worships and tenant associations endorsed. 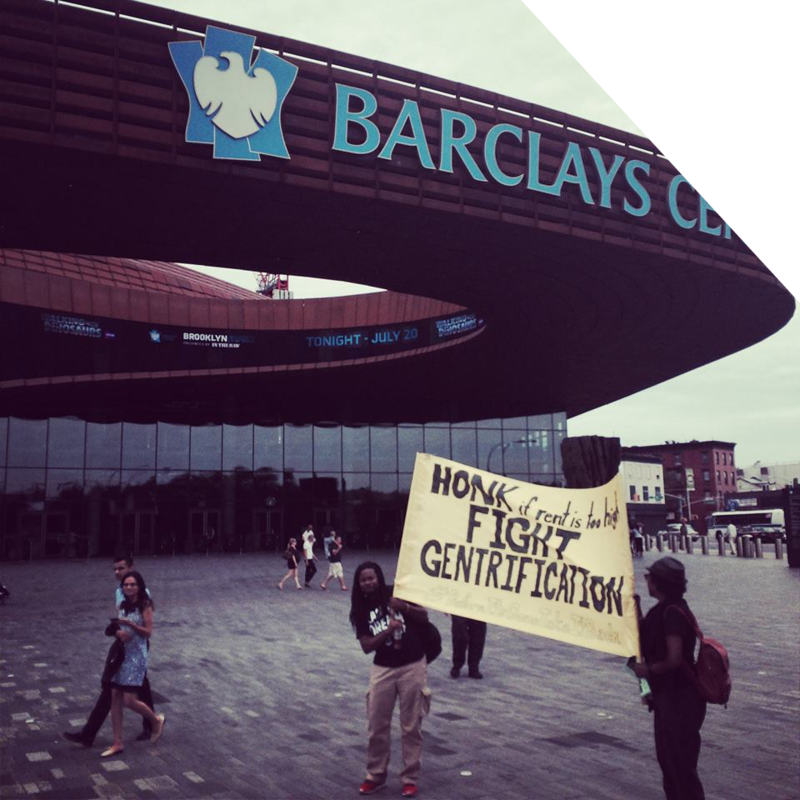 We increased the community content of BEFORE IT’S GONE // TAKE IT BACK: Documenting Brooklyn – Fighting Gentrification (B4G) website – the first social media platform devoted to fighting gentrification in Brooklyn. We initiated the Rapid Response Legal Fund to provide trusted lawyers for free / or low cost for Brooklyn tenants, homeowners, and small businesses. Equality for Flatbush (E4F) is a resident-led and volunteer-run organization doing anti-police repression and anti-gentrification organizing in the communities of East Flatbush, Flatbush and Brooklyn-wide. We have only two goals – to end NYPD murders and to stop the displacement of low to middle income people from our community.